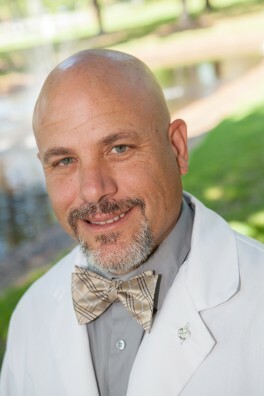 Former U.S. Army flight medic John W. Rothwell, III, BSN, RN, is pursuing his Doctor of Nursing Practice (DNP) at UCF. In its recently published rankings, U.S. News & World Report has named the UCF College of Nursing among the top 25 “Best Online Graduate Nursing Programs for Veterans” for 2015. The college ranks 23 in the nation and is the highest ranked program in Florida. UCF has long supported veteran students and has been named a “Military Friendly School” by G.I. Jobs magazine since 2011. The university’s Veterans Academic Resource Center is specifically designed to help veterans achieve academic success by providing a one-stop solution to support their needs during the transition from military to student life. The College of Nursing has a strategic relationship with the Veterans Affairs medical facilities for clinical rotations. For former U.S. Army flight medic John W. Rothwell, III, BSN, RN, this relationship was one of the primary factors for selecting UCF. Nurses with a BSN degree or non-nursing baccalaureate may apply for graduate programs, while those with an associate’s degree may apply for an RN to BSN or RN to MSN program. Scholarship opportunities are also available to veterans and active duty military. To be considered in the rankings, colleges had to participate in key programs that offer educational benefits to people with military service and be among the top 75 percent of schools in the U.S. News 2015 Best Online Programs rankings. Those rankings, in which the College of Nursing is ranked among the nation’s top 25 for graduate nursing programs, are determined based upon numerous factors, including affordability, faculty credentials, student services and reputation. proud of this veteran continuing to serve! Thanks for this article, UCF.